Bigos or Hunter's Stew - Delicious! Home Baked Bread & Butter Hot From The Oven! Hot Bowl of Our Yummy Chicken Noodle Soup! Bigos, or Hunter’s Stew, is considered the most traditional of all Polish dishes. Famous in poetry and in novels, this stew was served at royal banquets and hunts and still is the king of all dishes. It usually takes 2 to 3 days of cooking to achieve the full harmony of ingredients that go into making a good Hunter’s Stew. Our Bigos is made with sauerkraut and fresh cabbage, various kinds of smoked sausages, lean cooked ham cut into cubes, beef, pork, onions, fresh and dry mushrooms and seasoning. 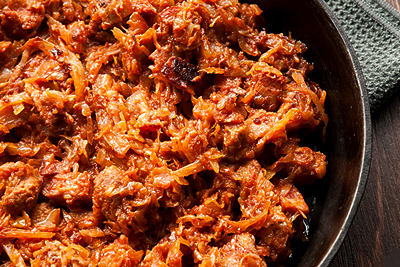 We simmer our Bigos to perfection, all you have to do is reheat it and enjoy the wonderful taste. Reheating will only add to the flavor and aroma. our delicious Bigos Stew (Hunter’s Stew)! Copyright © MJ Polish Deli. All Rights Reserved.